Owly, a Short-eared Owl from Alaska, started on his career path as an educator when he crashed headlong into the floodlight of a fishing boat out on the open ocean during his first migration. After winning over the crew of the boat and the villagers of Saint Paul Island as they all came together to care for the injured raptor, Owly traveled by plane to the Bird Treatment and Learning Center in Anchorage, where he received more specialized care. Owly's physical injuries healed first; his psychological healing did not really begin till he was moved out of the clinic and into the stimulating environment of volunteer Barbara Doak's sunroom cage in her home. While watching birds at the nearby birdfeeders, he became animated and began to eat on his own for the first time since his injury. It soon became apparent, though, that vision problems sustained during his crash would be permanent, leaving him unable to see well enough to live in the wild again. He then accepted a new job as an educator, working with the treatment center's staff as an ambassador for his kind. Owly's easygoing temperament makes him an excellent choice for educating blind and partially sighted people, who can relate to his handicap. But perhaps Owly's biggest achievement came on an occasion when his audience included an autistic child. He was able to connect with this child, apparently, as no human had: the little boy, previously considered to be without language capabilities, ran up to his teacher and spontaneously began asking questions about Owly, astounding parents and teacher alike. Barbara Doak, Owly's handler and keeper, sees him as a very special individual. "He's a very polite, nice bird," said Doak. It was Doak's son Dan who suggested she submit a nomination for Owly for the World Owl Hall of Fame's Lady Gray'l Award. When Dan was told that Owly had won, he responded, "I have never known such a famous owl before, let alone one so modest." Owly has made so many connections - connections that warm people's hearts to all owls. In his 14 years of work so far, he has touched the lives of 9,800 people, both in the city of Anchorage and in remote villages requiring flights in small aircraft. And yes: he has also been back to visit the people of Saint Paul, who worked so hard to save his life. 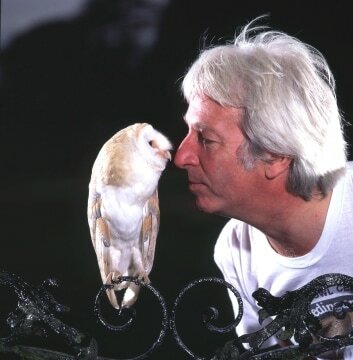 Tony Warburton, Honorary President of the World Owl Trust in Cumbria, England, dedicated the past 40 years of his life to owls. His interest in the creatures sparked when as a young lad he was out collecting firewood with his grandfather and caught sight of his first Tawny Owl. He had a voracious appetite for all books about wildlife, and his "Observer's Book of Birds" got a particularly hard workout. He was especially enthralled by a portrait of a somewhat "spooky" Barn Owl on page 115 of this book, and from there his interest in owls snowballed until in 1982, with two friends, he co-authored the first monograph to be published about this bird, the result of almost 40 years of combined fieldwork by the authors. Warburton's extensive work on behalf of owls has included over 1,000 conservation lectures with live owls throughout the UK and Finland, four decades of owl research, countless magazine and periodical articles, and hosting wildlife programs on British and Dutch television that often focused on owls. Given his work, it's no wonder that this man is considered the forefather of owl research, conservation, and rehabilitation in the United Kingdom. Over the years Warburton has founded several organizations to help owls through captive-breeding programs in concert with habitat protection and restoration. In 1972 he created the British Owl Breeding and Release Scheme which succeeded in releasing over 1,600 captive-bred Barn Owls as well as many other species back into the wild once suitable habitat had been restored. In 1987 he created the World Owl Centre, the world's first Owl Conservation Breeding Centre to open to the public, with 80,000 to 93,000 visitors per year. And perhaps the capstone of his achievements was to found the World Owl Trust, to work to save owls on an international scale. The Trust now has over 3,000 members worldwide and has a Memorandum of Understanding with the Philippine government to manage the Philippine Owl Conservation Programme in that country. The agreement led to the first breeding of the rare Philippine Eagle Owl in captivity in 2005 and again in 2006, resulting in a much greater understanding of the species overall, knowledge which can now be used to help this highly endangered species in the wild. Unquenchable enthusiasm has been the hallmark of Warburton's work and personality. He has inspired countless other to follow in his footsteps and strike out on their own in the name of owls. At age 71, he has no intention of ever retiring, for he says, "The battle is far from won as yet!" "To say I am honored to receive the award is the understatement of the year," says Warburton. It has special meaning to him since it is an award judged by his peers. Katherine McKeever and Robert Nero, both of Canada and recipients of the 2006 Champion of Owls Awards, are people that Warburton looks up to, and he is humbled to be named for the same honor.